Never tangle with cords between your ears again when you use AirDops True Wireless Earbuds. Enjoy a full range of motion without worrying about catching the wires on your clothes or hair. These wireless earbuds have the same sound quality as Apple’s AirPods for a quarter of the price. AirDops True Wireless Earbuds allow you to exercise, walk in your neighborhood, or commute without any interruptions in your music, podcast, or phone call. The earbuds pair to your device for a seamless connection anytime. Just pop the earbuds for an hour into the pocket-sized charging case for three hours of nonstop listening. Add up to eight hours of playtime by inserting them in the portable case. With a discount of over 60%, AirDops True Wireless Earbuds are a steal. 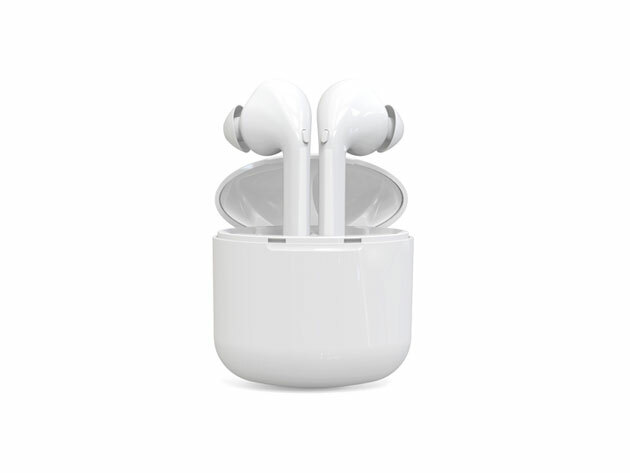 Pair the earbuds with Siri to stay synchronized with your iPhone. The three included sets of ear tips will fit any size or shape ear comfortably. Enjoy the flexibility of wireless earbuds by purchasing AirDops True Wireless Earbuds in the Daily Caller shop. The price has been reduced from $99 to $29.99. Save an additional 15% with the discount code SEMIANNUAL bringing the final price to $25.49.